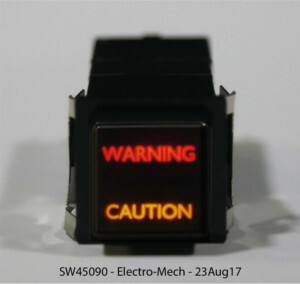 SOUTH EL MONTE, Calif., August 23, 2017 — Electro-Mech’s new SW45090 daylight readable switch has been co-designed and approved by Aero Safety Systems for cockpit installation in general aviation aircraft. terminals which accept 20awg wire, or the unit can be provided with PCB pin terminals. Aero Safety Systems have optimized the LED circuitry and optics to provide clear Full Daylight readability whilst also achieving a dead face when not illuminated. Through high quality multi-layer silk screen printing on carefully selected diffusers, filters and hard coat anti-glare coatings; high contrast levels and a crisp legend are achieved. Careful attention to thermal management with high quality LEDs ensures long life. As a further safeguard each legend is triple redundant. Each legend of the SW45090 can be directly driven with PWM constant current at 50mA. The circuit is also fitted with a current limiting resistor as standard available for either a 12 or 24 volts DC system.